September 2018 will see the international Conference and Exhibition to mark the end of the 15cBOOKTRADE Project. Data and visualisations from MEI and TEXT-inc databases will inform the content of the two events. 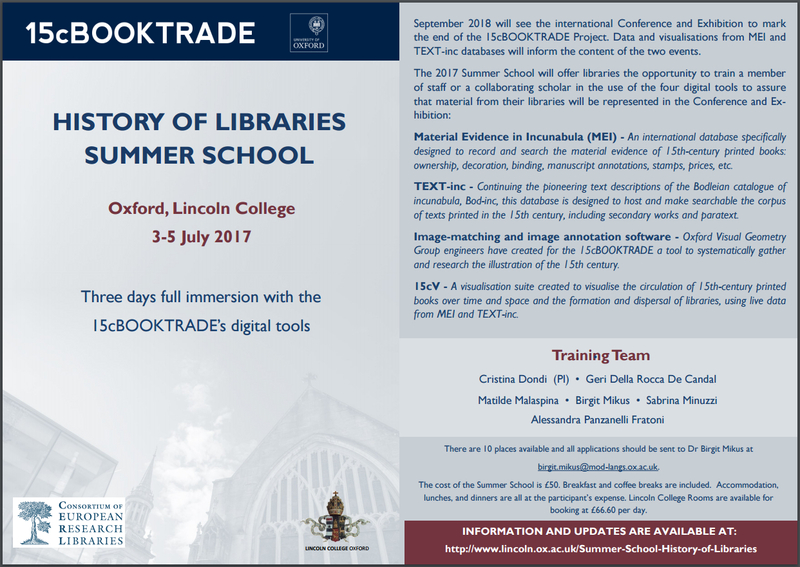 The 2017 Summer School will offer libraries the opportunity to train a member of staff or a collaborating scholar in the use of the four digital tools to assure that material from their libraries will be represented in the Conference and Exhibition. An international database specifically designed to record and search the material evidence of 15th-century printed books: ownership, decoration, binding, manuscript annotations, stamps, prices, etc. The collaborative enterprise of over 300 European and American libraries, it contains over 20,000 high quality records and the identification of 10,000 former owners. Locating and dating any material and documentary element enables the movement of books across Europe and the US to be tracked throughout the centuries, from place of production to the books’ present locations. Continuing the pioneering text descriptions of the Bodleian catalogue of incunabula, Bod-inc, this database is designed to host and make searchable the corpus of texts printed in the 15th century, including secondary works and paratext. Oxford Visual Geometry Group engineers have created for the 15cBOOKTRADE a tool to systematically gather and research the illustration of the 15th century. Images and their metadata will be systematically searchable by text or by image, and linked to the Incunabula Short Title Catalogue (ISTC) and Gesamtkatalog der Wiegendrucke (GW). A visualisation suite created to visualise the circulation of 15th-century printed books over time and space and the formation and dispersal of libraries, using live data from MEI and TEXT-inc. Cost: The school will charge student fees of 50 British Pounds, payable prior to the first day of classes. Students are individually responsible for their transportation and living expenses in Oxford. Numbers: There are ten places available. Accommodation: at participant’s expense. Lincoln College Rooms are available for booking at £66.60 per day. Breakfast and Coffee Breaks: included in the School’s fee. Lunches and Dinners: at participant’s expense.